So, the talent still lingers after all. Once upon a time, a 'Michael Schuamcher tops qualifying times' headline would have caused no more than a shoulder shrug. But today the great man doing so was genuinely remarkable. Almost no one saw it coming. The surprise was particularly acute given that so many failed to hold back after Schumi exited the last round in Spain by driving into the back of Bruno Senna, writing him off as finished and touting many potential replacements. Well today, not for the first time, Schumi bounced back and then some, ensuring widespread consumption of humble pie. Throughout his F1 career he's one who has often personified that the wounded animal is the most dangerous, and all the old skills were on show as he hustled his W03 around the tight Monaco confines to set the fastest time. Perhaps there are a few who should have known better. Further, while his clash with Senna looked a misjudgement, the declaring of it representing the death throes of Schumi's career was surely excessive given that, this incident aside, he has driven well this year. One can point at his relative lack of points, but this is mostly attributable to bad luck with unreliability (see Australia, China and Bahrain qualifying), being hit by errant opponents (see Malaysia) and grid penalties (see Bahrain). It seems to be an unfortunate maxim of many expressing an opinion, not just in F1 but in most walks of life, that you're only as good as your last game. Today showed the folly of such an outlook. But unfortunately for Schumacher, and many of us anticipating the race tomorrow (and who like to see fine efforts achieve their reward), the Senna clash has had one final bite at him. The resultant five-place grid drop means he'll actually start in sixth place on tomorrow's grid. Barring rain or other unusual happenings, even he'll struggle to overcome that to win. 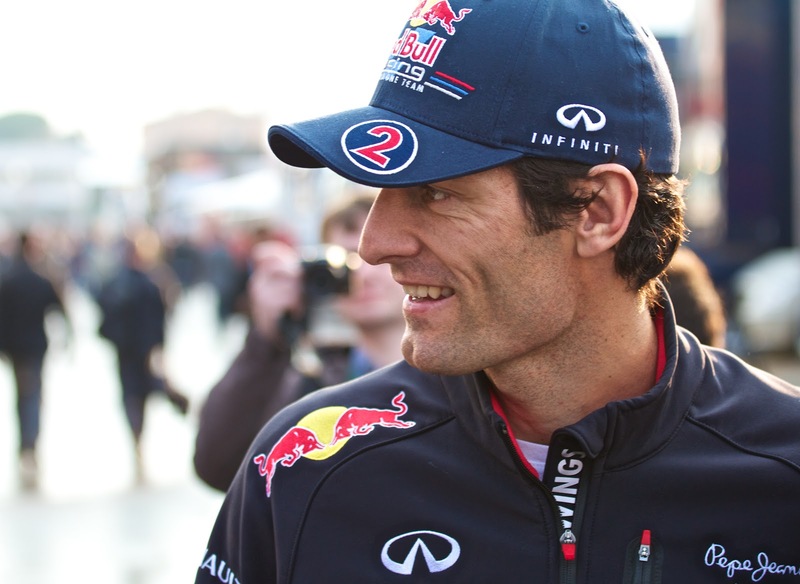 This means that it's another old dog (assuming he doesn't mind me referring to him thus) Mark Webber who'll line up on pole position. The efficacy of his efforts was about as unexpected as Schumi's. While he's been in good form this year Webber wasn't being mentioned much in advance among the potential pole-takers. Further, his usually prodigious stable-mate Sebastian Vettel never seemed comfortable or confident in his RB8, and abandoned his final qualifying session early (rather oddly) and will start ninth. But Webber, another showing a lot of his old form, squeaked ahead of all bar Schumi in a tight final shoot out. It's an overused phrase, but no less true for that, that track position is all at Monaco and thus Webber looks very well placed. 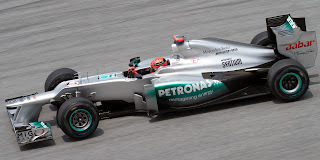 Schumi's team mate Nico Rosberg will line up alongside Webber on the front row. Mercedes continued its mercurial season today, and looked just about the quickest things out there throughout the qualifying hour. However, I hear you cry, the Mercs haven't always replicated their qualifying pace on race day in 2012. Well, tyre wear (the Mercs' major race day problem) is relatively low at Monaco due to the low speeds, and that may be just enough to give Nico a good day tomorrow. You suspect the outcome could go either way though (and if he does back the pack up it'll help Webber no end). Then we have Lewis Hamilton in P3, who was mighty as always around the Principality but was in a McLaren that never looked fully at one with the circuit. Indeed, Jenson Button didn't even make the top ten in his. There then follows the Lotuses and Ferraris, who didn't quite live up to their advance promise. Romain Grosjean starts at the head of them in a net fourth, then follows the two Ferraris with Fernando Alonso ahead (though now split on the grid by the penalised Schumi), and Kimi Raikkonen, looking like he never recovered from missing almost an entire Thursday practice session, will start in eighth. Ferrari's approach in the final qualifying session was particularly odd, leaving it to the last moments to set their cars' times. Given that Monaco pace is all about building yourself up to a rhythm, and the problems invariably encountered with traffic, it seemed a high-risk strategy, and was one that never received reward (indeed, Alonso set only one representative lap time in Q3). The Scuderia's crumb of comfort, aside from the fact its car has looked good all weekend, is that Felipe Massa has been in fine form, and was a little unlucky not to finish up the quicker of the two red cars. In a tight pack with degrading tyres, tomorrow's race has plenty of life in it. And given what we've experienced in 2012 predicting who will triumph is a treacherous activity. The best advice is to sit back and enjoy it, as it'll be entertaining. It could well be that the race winner is someone we haven't even considered yet.